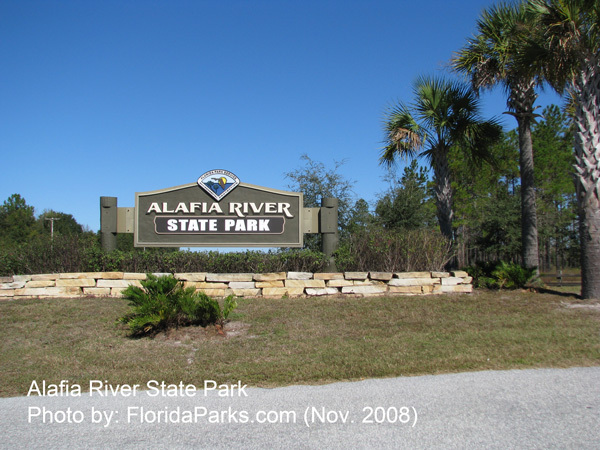 Alafia River State Park opened to the public in February 1998. The park consists of over 6,000 acres with approximately 12 miles of shoreline along the South Prong Alafia River. The land was formerly used for phosphate mining and was donated to the Florida State Parks in 1996. As a relatively new addition to the Florida State Parks, Alafia River State Park offers some of Florida's unique recreational opportunities. The Park offers off road bicycling, horseback riding, hiking, fishing, camping, picnicking, bird watching, canoeing and kayaking. Eight distinct natural communities in addition to ruderal and developed areas are present at Alafia River State Park, they are; scrub, xeric hammock, floodplain swamp, baygall, bottomland forest, upland mixed forest hydric hammock, and blackwater stream. 8 a.m. until sunset, 365 days a year. Coming from the North (Tampa) Take I-75 south to State Road 60, head east approximately 12 miles to County Road 39. Go south on County Road 39 approximately 13 miles until you reach the entrance to the park located on the left side of roadway. Coming from the South (Sarasota). Take I-75 north to U.S. 301. Go north on U.S. 301 to County Road 674. Go east on County Road 674 to County Road 39. Go north on County Road 39 5 miles until you reach the entrance of the park on the right side of roadway. Canoeing and Kayaking are a popular activities in the Alafia River and the reclaimed lakes. Currently Alafia River State Park does not offer canoe rentals. Alafia River State Park offers numerous lakes for fishing. Bass, bluegill and catfish are among the fish that you may catch. Catch and Release is recommended for Large Mouth Bass. A fishing license is required for all freshwater fishing for people 16 and older. Please go to the Florida Fish and Wildlife Conservation Commission web site and get your fishing license on-line. Alafia River State Park currently offers camping in our new 30-site campground with facilities. Water and 50 amp electrical service is available at each site. Riders can enjoy a relaxing day of approximately 20 miles of equestrian trails. The horse trails are well marked and wind around lakes, over hills and through wooded areas. The blue trail is a perimeter loop, the white trail runs north and south, the green trail runs east and west, and the yellow trail is an island loop. The equestrian trails would not have been possible without the assistance and dedicated volunteers of the Triple B Riding Club. For further information on the Triple B Riding Club visit their web site at Triple B Riding Club. You can enjoy a peaceful picnic lunch with a beautiful view. There is also a playground available for the children. Wildlife viewing is possible on all the trails, the picnic area, from the many lakes and the Alafia River so bring your binoculars.